When Marcel Gery reached the podium at the Barcelona 1992 Olympic Games it was a reward for his perseverance and refusal to abandon his Olympic dream. Politics and bureaucracy prevented Gery from attending three Olympics. It forced him to defect from his native Czechoslovakia and come to a country where he didn’t know anyone and couldn’t speak the language. “It was just unfinished business,” said Gery. “For every amateur athlete the Olympics is the pinnacle of their career. Gery, a butterfly specialist, was part of the 4×100-metre medley relay team – along with Jon Cleveland, Stephen Clark and Mark Tewksbury – that won bronze in Barcelona. Gery also won medals for Canada at the Pac Pacific Championships and the Commonwealth Games. 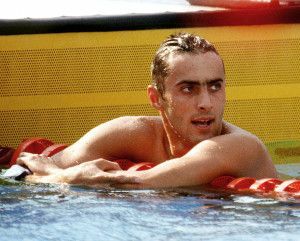 In 1990 he set a short-course world record in 100butterfly in Leicester, England. Gery was born March 15, 1965, in Smolenice, Slovakia. He made the qualifying standard for the Czechoslovakian team competing at the 1980 Olympics but government officials thought he was too young (15) to go to Moscow. The Eastern Bloc boycott of the 1984 Games kept him from swimming in Los Angeles, the second in a row. Following the 1986 world championships the 21-year-old Gery and his wife Michaela decided to defect to Canada. They travelled to Yugoslavia and, through the help of coach Jim Fowlie and the North York Aquatic Club, he and his former teammate Vlastik Cerny came to Canada. “Looking back, it was an insane decision,” said Gery, now a Toronto real estate broker and the father of two sons. “It felt like a big adventure, but cant imagine that one of our sons do the same to us what we did to our parents. Gery’s Olympic woes continued when he wasn’t granted Canadian citizenship in time for the 1988 Games, that was a third in a row. At the 1990 Commonwealth Games he earned three medals, including a gold in the 4×100-m medley relay. With time running out on his career and his Olympic dream, Gery finally swam in Barcelona. “I never really thought after ’88 I was going to be around until ’92,” he said. Besides being inducted into Swimming Canada’s Circle of Excellence, Gery is also a member of the Ontario Aquatic Hall of Fame.